Between 2007-2011, smoke alarms sounded in only HALF of the home fires reported to U.S. fire departments and if a fire starts in your home you have 2 minutes to evacuate! That’s why it’s so important to have working smoke detectors to keep you and your loved ones safe. Smoke alarms that are properly installed and maintained play a vital role in reducing fire deaths and injuries. Did you know? Having a working smoke alarm cuts the chances of dying in a reported fire by 50%. National estimates of reported fires derived from the National Fire Incident Reporting System (NFIRS) and the National Fire Protection Association’s (NFPA’s) fire department survey show that in 2009-2013, fires in homes with no smoke alarms caused an average of 940 deaths per year (38% of home fire deaths). An additional 510 people per year (21% of home fire deaths) were fatally injured in fires in which smoke alarms were present but failed to operate. Power source problems were the leading cause of smoke alarm failures. The death rate per 100 reported fires was more than twice as high in homes with no or no working smoke alarms (1.18 deaths per 100 fires) as it was in fires with working smoke alarms (0.53 deaths per 100 fires). 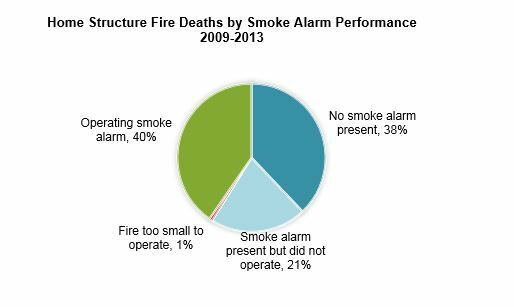 The lowest fire death rates were seen in homes with hardwired smoke alarms and sprinklers. Victims in homes with working smoke alarms were more likely to have been in the area of origin. They were also more likely to be 65 or older, to have a physical disability or to have tried to fight the fire themselves. 1. Install smoke alarms in every bedroom, outside each sleeping area and on every level of your home. 2. Make sure you test your smoke alarms every month, not once a year as many people are accustomed to, typically around daylight savings time. When you do, first alert family members that you will be testing the alarm. Then press and hold each smoke detector’s test button. If the detector is functioning, a loud, high pitched chirp will sound. If it does not, try changing the battery, but if the problem persists, contact an electrician to evaluate is there is a wiring issue. 3. Replace all smoke alarms in your home every 10 years. And of course, use common sense. When a smoke alarm sounds, get outside and stay outside. Statistically speaking you may have 2 minutes but don’t gamble when your life is at risk.